The B.C. Liberals will return $70,000 of taxpayer money after a damning report into the province's ethnic outreach scandal indicated that the party misuesed government resources. On Thursday, Premier Christy Clark's deputy minister, John Dyble, released the report suggesting that inappropriate activity occurred. Specifically, Dyble noted that confidential information-such as contact lists from government events was inappropriately sent to personal email accounts and that there were "two serious instances of government resources being misused." Brian Bonney, who served as a senior political aide for 16 months in the Clark government, was...found in a serious breach of conduct. The investigation found he spent as much as half of his time in government working on B.C. Liberal business. The other example involved a plan, initiated outside of government, to hire community liaison contractors at public expense. “It is absolutely critical that we do not leave any evidence in us helping them through this application,” warned a political aide in a private e-mail to Mr. Yap. Bonney left government in February. The author of the email to Yap, Mike Lee, resigned on Thursday. The report does not incriminate Premier Christy Clark at all. The premier did, however, speak with reporters. "This document is not easy reading for people in government,"Clark said adding that the Liberal Party had already written cheque for $70,000 to the government. Dyble's investigation and report were made necessary after the opposition NDP revealed a leaked 17-page multicultural outreach strategy late last month, outlining the Liberal Party's plan to win ethnic votes in the May election. Clark denied any previous knowledge of the ethnic vote plan but her deputy chief of staff, close friend and confidant Kim Haackstad stepped down over her role in the scandal. Multiculturalism Minister John Yap also resigned pending the investigation by Dyble. Clark announced on Thursday that Yap will not return. 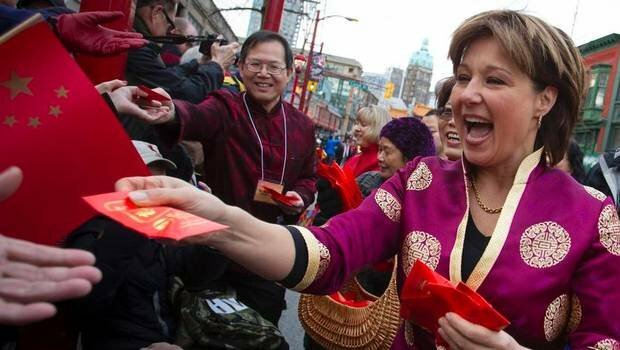 That wasn't the only the only bad news for Christy Clark and her lowly Liberals on Thursday. Earlier in the day, a new Ipsos Reid/Global News poll showed Clark's party trailing the opposition New Democrats by a whopping 19 percentage points in the polls. "51 per cent of British Columbians say they support the BC NDP, compared to 32 per cent who would support the BC Liberals, a drop of three per cent," according to the report. Veteran Global News reporter Keith Baldry suggests the poll is significant. The poll was conducted before Dyble's report.